Taiwanese actress, Michelle Chen (陈妍希) attended Calvin Klein Fall/Winter 2013 runway presentation held during the New York Fashion Week in New York City on February 14, 2013. 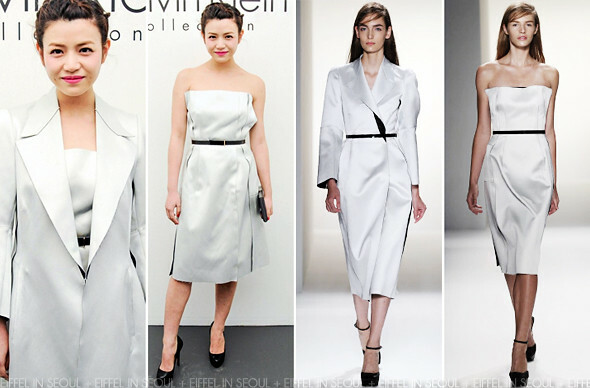 The actress wore a strapless dress from Calvin Klein Spring/Summer 2013 collection. A matching coat from the same collection and black clutch to complete her look. The length of the dress really works for her. I wished she had a more dramatic accessories to go with the dress. The hair is too severe, fashion fail.